Supplementary material reads: "Chernus -- Long Beach. Captions. Court attempt suicide. One neg shows ambulance attendants hauling Jack Howd, 28, of 1741 Pacific Avenue, Long Beach, out on stretcher after he attempted to end his life in prisoner detention room off Department C., Long Beach. 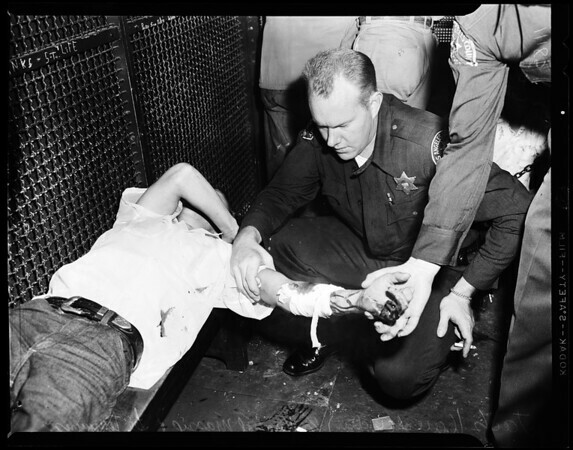 Three negs show l. to r. Jack Howd, 28, of 1741 Pacific Avenue, who slashed left arm with razor blade secreted on his clothing after Superior Court Judge Joe Raycraft sentenced him to State's prison on fictious [sic.] check charge. One of above negs show deputies holding finger on artery, preventing flow of blood. Deputies l. to r. are Hershal Massie and Lee Timmons".